So apparently, the late Cristian Nemescu's shamefully overlooked California Dreamin' (Endless) was quietly slipped into American theaters on January 23 after nearly two years, and I had no idea. If you've been a regular reader of From the Front Row of any frequency, then I've made my love of Romanian film pretty well known. The spectacular renaissance and cinematic growth coming out of Romania caused by the sudden influx of funding to filmmakers is nothing short of astonishing. From Cristi Puiu's The Death of Mr. Lazarescu in 2006, to Corneliu Porumboiu's 12:08 East of Bucharest last year, to this year's finest film, Cristian Mungiu's 4 Months, 3 Weeks, and 2 Days, the Romanians are consistently and effortlessly putting out some of the best films around. Needless to day, going into Cristian Nemescu's California Dreamin' (Endless) at this year's River Run International Film Festival, my expectations were high. And I wasn't disappointed. Nemescu was heralded as one of the most promising new talents of the Romanian New Wave, but was tragically killed in a car accident before editing on California Dreamin' could be completed. So to honor the director and his vision, the film was released as-is, running a staggering 155 minutes. The film as it was released is probably not the final cut Nemescu would have made, there are parts here and there that could be trimmed and streamlined, but the film as a whole feels remarkably complete. 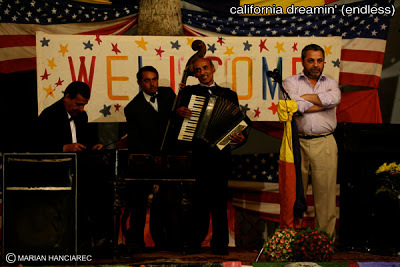 Set in Romania in 1999 during the Kosovo conflict, and based on a real event, California Dreamin' tells the story of a group of American soldiers traveling through Romania on a train to deliver parts for a new radar system to the Serbian border, who are unexpectedly delayed by railroad station operator who demands they present customs papers that they do not have. Stuck in the middle of nowhere in a tiny, backwater town, the soldiers have no choice but to stay while the slow hand of the government works to procure the proper paperwork. Meanwhile, the town's overeager mayor, ecstatic about the presence of Americans in his town, decides to throw a party in celebration of the town's 100th anniversary (which was actually five months prior) in order to welcome and the soldiers from across the ocean. On the surface, California Dreamin' is a droll, self-mocking comedy based on the backwater Romanians' quest to impress the Americans with their Elvis impersonators and portraits of Bill Clinton (their efforts at hospitality become increasingly ridiculous), but there is a lot more going on here on second glance. California Dreamin' is a film of many layers. The film is intercut with black and white flashbacks from WWII of Doiaru (Razvan Vasilescu), the hard-nosed station master, who, as a little boy was told by his parents fleeing the Russians that they would return after the Americans arrived. But the Americans never came, and the Communists remained in power until the Romanian Revolution in 1989. After 55 years, the Americans have finally arrived, albeit not in the way he expected. Harboring a deep-seeded hatred of Americans caused by this historic letdown, Doiaru runs afoul of the equally hard nosed American Captain Jones (Armand Assante), who is determined to get his top secret shipment to its destination on time, and willing to do anything he has to do to get it. So the Americans finally arrive in Romania, but their continued presence and sometimes good intentions go sour and cause chaos wherever they go. It's a film about a world under the thrall of an America whose idealistic image doesn't exist, and maybe never did. It's Nemescu's wry and subtle commentary that gives California Dreamin' its backbone (the title itself is a sly mocking of American policies). He expertly balances comedy, drama, romance (the amorous meetings of the American soldiers with the local Romanian girls adds yet another layer to the film), and tragedy with equal aplomb, and his death is a major loss to film and to art as a whole. California Dreamin' is a feast, and it feels much shorter than one would expect from a film of its length. This is skilled filmmaking on a hugely impressive level, and I sincerely hope it gets the American release that it, and the memory of its late director, deserve.